This is the first game in the Mr. Driller series. 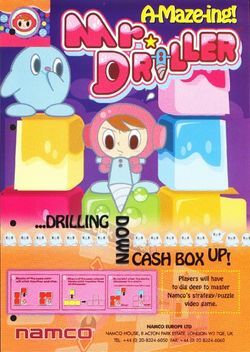 For other games in the series see the Mr. Driller category. Mr. Driller (ミスタードリラー, Misutā Dorirā?) is a puzzle arcade game that was released by Namco in 1999. This game and the resulting series is a spin-off from the Dig Dug series. Mr. Driller puts the player in the role of a driller moving down through screens of blocks, having to keep his air supply from running out while avoiding being squashed by falling blocks. The main character of these games is Susumu Hori, the son of Taizou Hori, who was the star of the original Dig Dug game. The project that would become Mr. Driller was originally intended to be a third game in the Dig Dug series, under the working title of Dig Dug 3. Hexagonal blocks were briefly considered, but this idea was abandoned when chain construction proved to be too complicated. Dig Dug 3 was initially developed unofficially by a few Namco staff; however, work on the game was suspended while R4: Ridge Racer Type 4 was being completed. However, Namco executives were impressed with the game and decided to support it as an official project. Players must select one of two challenges (2500ft for beginners and 5000ft for experts), and drill through as many coloured blocks as they can, until they reach their goal. Mr. Driller has a limited amount of air which drains continuously throughout play, but can be replenished by collecting air capsules. Destruction of "X-Blocks" must be avoided or the player suffers a 20% air penalty. When four or more X-Blocks are in contact with each other, they'll disappear and leave a small blue creature (called a "Chisokojin") behind who is worth 765 (Namco's goroawase number) extra points. JP GB Color cover art. This page was last edited on 12 October 2015, at 16:00.